Upon arrival in Hanoi, you will be met and transferred to our hotel and then be free to enjoy the rest of the day. Tonight we will have dinner at a fine restaurant in Hanoi. Our trip will start at around 08:00AM. We will visit the Ho Chi Minh complex and the Temple of Literature, then We will stop for lunch at a fine cuisine restaurant. In the afternoon we will be free to enjoy our leisure. In the evening we will leave Hanoi for Lao Cai by soft sleeper train. You are welcomed by guide and driver at Lao Cai train station and transported to Sapa, having breakfast at the hotel before walking about 12km along the mountain trails or main road to visit Suoi Ho, Matra and Taphin villages which are inhabited by Black Hmong and Red Dzao tribes. Along the way we can come in some schools as well as tribal houses to have experience of local Sapa life. Moreover, the landscape, culture, custom and tradition of Black Hmong tribe of Suoi Ho and Matra villages are preserved from tourists so you can study the raw things here. Picnic lunch will be served on the way. Arriving at Ta phin village of Red Dzao people in the late afternoon, we are transferred to Sapa by car. We will stay overnight in Sa Pa town. Upon an early arrival back in Hanoi We will transfer to the hotel in order to relax and have breakfast. 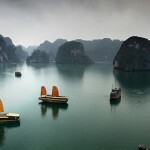 We depart Hanoi to Ha Long Bay, which is now one of seven World Heritage-listed sites in Vietnam. Rising early we can hear the sound of the ocean coming to life for another lovely day. We will have our breakfast over sunrise before more exploration of Ha Long bay by junk and then by rowing boat to the lagoons. We will visit Luon cave, and the floating villages. We then sail to explore the Bay and have a fresh seafood lunch on board before approaching Ha Long wharf. We will return to Hanoi at around 03:00PM. There is an overnight at a hotel in Hanoi. Today we are free and at our leisure until the time to transfer to the airport for you flight home. All hotels 3 – 4 star accommodation.